New Mills One World Festival - one of the High Peak's most popular events - is returning for 2019! This year's theme is "Seeds of Change"
The free open air festival, which celebrates the themes of peace, the environment, cultural diversity, community and world development, will be taking place on Saturday 6th July 2019, from 12 noon until 6 pm at High Lea Park, St Mary’s Road, New Mills. A wide range of bands and performers, from both the High Peak and further afield, will provide entertainment throughout the afternoon. Alongside the music, there will be various talks, discussions and activities taking place, including some based on this year's theme. There will also be various stalls at the event, where those attending can engage with various charities, campaign groups, organisations and local businesses and learn about the work they do and products and services they offer. Those attending will not be going hungry or thirsty, as there will be various food and drink stalls at the event, as well as a licenced bar. 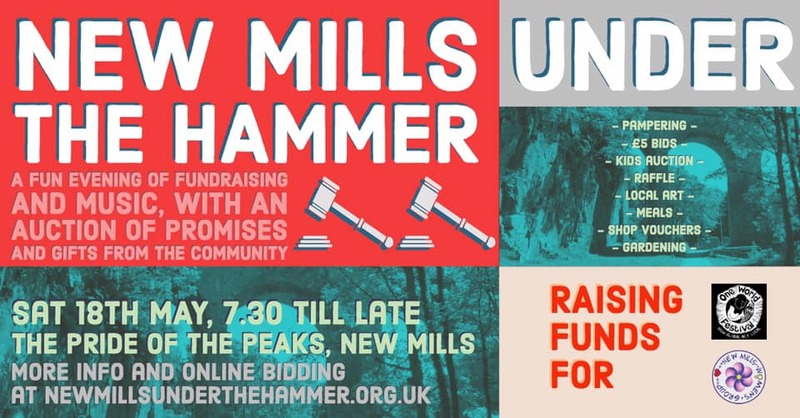 New Mills under the Hammer is a local fundraising auction of promises and gifts donated by the local community. Come along to have fun, grab a bargain in the auction, take part in a raffle and raise some money for two great local charities. The auction will take place at the Pride of the Peaks on Saturday 18th May starting at 7:30pm. Auction lots donated last year included signed books from local authors, a day at a local brewery, gift vouchers, theatre tickets, holiday accommodation, gift vouchers, celebrity autographs, gardening services, and even a pony ride. Something for everyone. On the night as well as the auction lots there will be music and a raffle as well to keep you entertained. If you can’t be there, you’ll be able to put bids on online. In 2019, the event is organised by a team of volunteers from two local charities: One World Festival and New Mills Women's Group with all proceeds being split equally between them. The One World Festival, taking place on 6th July in New Mills, is a popular, fun packed community event, with celebrating peace, the environment, cultural diversity and world development. New Mills Women's Group is open to all women in the New Mills area, who strive to support each other and work together to make a difference in the local community.